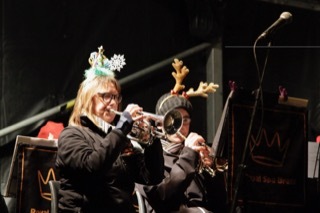 The spirit of Christmas was in on display on the 22nd of December as 3,000 people joined together for Carols at Warwick Castle, one of the most popular community events in the Warwickshire calendar and in the process raised money for local charities. 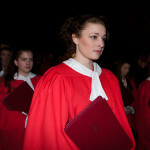 The Choirs of St Mary’s were led by Oliver Hancock, the new director of Music, who is also Choral Director at King’s High School. 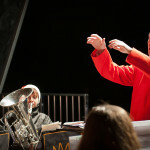 The choirs worked in partnership with the great team of musicians from Leamington’s Royal Spa Brass. 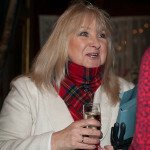 The event was led by compère, local celebrity Annie Othen, who entertained the crowd with anecdotes and challenges. On a seasonally chilly evening visitors were warmed with seasonal treats of mulled wine and chestnuts, hot food and drinks. To maximise the money for the charities Warwick Castle provides the facilities and support and sponsors dig deep to contribute. New sponsors this year include lead sponsor Warwick Independent Schools – Warwick School, Kings High and Warwick Prep, Warwick University and Rybrook BMW. The event also enjoys the longstanding support of Leamington Mazda, Warwick Printing, Warwick Castle and marketing and PR company LMMC. 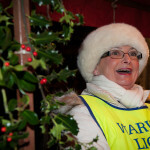 The money raised goes to support local good causes and is distributed by: Warwick Lions; Merlin’s Magic Wand, Rotary Club of Warwick and the Friends of St Mary’s Choir. The enduring popularity of this charity Christmas event has once again been outlined by the rapid “sell out” of tickets. Online tickets sold out early in December and walk up sales at the castle ticket office have accounted for the majority of the last few hundred tickets. It is now looking highly unlikely that there will be any tickets remaining by the night of the event so to avoid disappointment please don’t arrive on the night expecting to be able to purchase a ticket. Everyone attending can expect a fabulous evening of music and will of course be singing along to seasonal favourites led by the choirs of St Mary’s and Royal Spa Brass. An additional treat this year will be provided by the Phillips 66 choir who will be performing some seasonal songs while the crowd gathers. 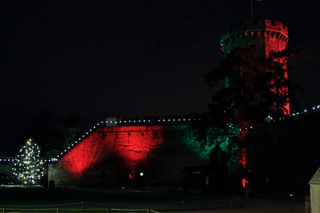 Once again the Castle will be lit up in vibrant colours, courtesy of main sponsor Phillips 66 and the Jet petrol stations. There will also be warming food and drink including: mince pies and sausage rolls, mulled wine, beers, alcohol infused hot chocolate and coffee and regular tea and coffee. The event raises funds which are distributed to local good causes by Rotary Club of Warwick. Warwick Lions, Merlin’s Magic Wand and the Friends of St Mary’s Choirs. Discounted ‘early bird’ tickets now available for the annual carols at the castle event! Early bird discounted tickets are now available for the annual Carols at the Castle charity event to be held at Warwick Castle on December 17th. 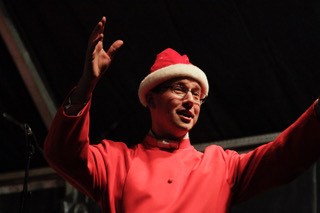 Tickets can be bought from the Castle booking office or online https://www.warwick-castle.com/events/carols-at-warwick-castle.aspx and are £6 on or before 1st December and £7.50 after 1st December. Children under 12 have a special ticket for £1. All proceeds go to local charities and good causes. The popular event is organised by volunteers from local charities: The Warwick Lions, Rotary Club and Friends of St Mary’s Choir and Merlin’s Magic Wand, who raise money for many local good causes. The facilities at Warwick Castle are provided free of charge as part of the attraction’s community involvement, maximising the funds raised. 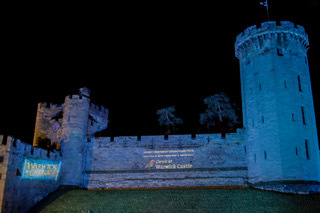 Set against the East Front the Castle grounds make a magical setting and once again, courtesy of sponsors Phillips 66 and Jet, the event will feature colourful projections against the Castle walls enhancing the drama of the event. Other sponsors include Leamington Mazda, Warwick Printing and marketing services company LMMC. The event will once again be led by popular local presenter Annie Othen and the Choirs of St Mary’s, and accompanied by the Royal Spa Brass Band. With hot food including mince pies and mulled wine and a sing along just part of the offer, it’s an evening not to be missed for families and friends alike. Early bird tickets on sale till the end of November, don’t miss out! Early bird discounted tickets will be available until the end of November, for the annual Carols at the Castle charity event held at Warwick Castle on December 19th. Grab some friends and family and sing some of your favourite carols on a merry winter’s night all for the discounted price of just £6. Make sure you, friends and family don’t miss out on one of Warwick’s finest nights of the winter. With all the revenue going towards local charities – Carols at Warwick Castle is a magical annual event for friends and families alike. 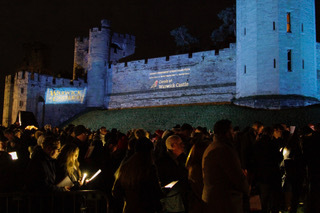 Early bird discounted tickets are now available for the annual Carols at the Castle charity event to be held at Warwick Castle on December 19th. 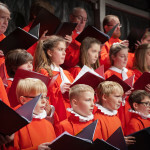 The popular event is organised by volunteers from three local charities: The Warwick Lions, Rotary Club and Friends of St Mary’s Choir who raise money for many local good causes. The facilities at Warwick Castle are provided free of charge as part of the attraction’s community involvement, maximising the funds raised. 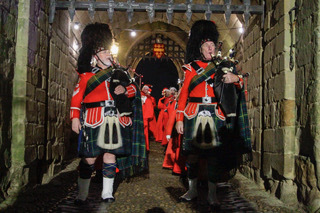 Lead by the Choirs of St Mary’s, and accompanied by the Royal Spa Brass Band, the evening is set against the magical backdrop of the Castle’s East Gate. With hot food including mince pies and mulled wine and a sing along just part of the offer, it’s an evening not to be missed for families and friends alike. 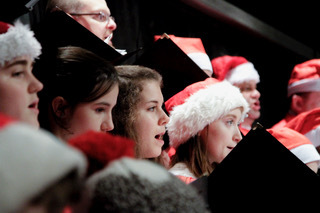 The Christmas spirit was alive in Warwick on Saturday evening for the annual Carols celebration. With over 2000 tickets sold and the pleasant winter weather drawing a large walk-up crowd, ticket sales once again raised funds for local charitable and community causes. The spectacular annual event held every December in the dramatic surroundings of Warwick Castle was again a highlight of the festive calendar. 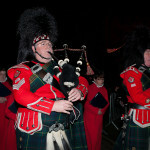 The evening was enjoyed by around 2,500 people who were entertained by the outstanding Choirs of St Mary’s Church and the Royal Spa Brass Band. 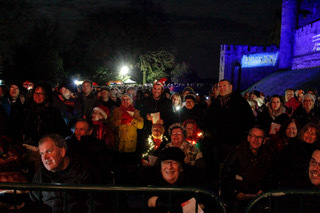 The event was compered by local celebrity and radio presenter Annie Othen and comprised of eighteen favourite carols, including ‘O Come All Ye Faithful’, selected by competition winner Zoe Allen to close the event on the Carols at Warwick Castle Facebook page, and a rendition of ‘Let It Go’ from Disney’s hit movie, Frozen. Students from Warwickshire College were invited to photograph the event as part of a social media initiative to engage young talent, organised by Jane Murray, the Lead for Photography at the institution. Photography from the event can also be viewed on the Facebook page at www.facebook.com/carolswarwick, alongside images from local photographer, Rachel Spivey. 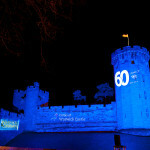 This year’s main sponsors saw their logos projected on to the side of Warwick Castle in a fantastic light display. 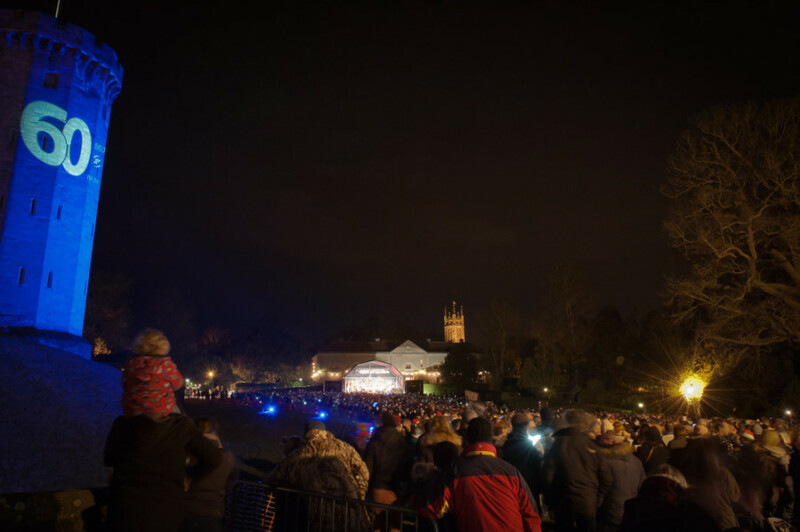 Several Midlands based businesses support the Carols event to make it a spectacular and memorable event for all – these include Philips 66, marketing agency LMMC, JET, Warwick Printing, Leamington Mazda and the venue Warwick Castle. Here is our recap of the 2013 event with a selection of photos from last year’s celebration. 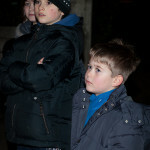 Alongside the images we have also found out what visitors had to say about the celebration on social media. We hope you all had a great time, or at least as much fun as you say you did, and we look forward to seeing you once again later in the year! Great open air @CarolsatCastle tonight. More Christmas carols by candlelight tomorrow evening in St Mary's church at 6.30pm. @PanchoPotatoes and ourselves are at @CarolsatCastle this evening. Just making the soups, and the chilli for tonight! Come say hi! 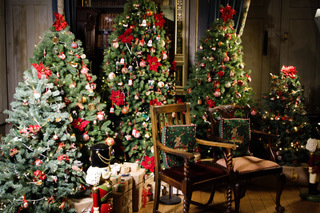 Welcome to our new site, the new home of Carols at Warwick Castle. The event continues to go from strength to strength, capitalising on new digital platforms and social media to build on its strong community links. The Warwick community is now not only local, but also digital. We hope that by refreshing our online presence and by becoming more flexible that we can raise more and more funds for important local causes. The new website is a reflection of this flexible approach enabling easy use on mobiles and tablets and more fully integrating the social channels. The growing conversation with supporters on Facebook has been an increasingly important feature of the event in recent years and we are in the process of improving this aspect of our communications to be even more responsive to information requests and the way participants like to share their pictures and the experience online. Keep an eye out for announcements, as tickets will go on sale in September with the usual early discount for buying in advance. The new website should help you keep an eye on what we’re up to, as the event thrives on your involvement and the shared positive experience. You can access our new Facebook page here.